Jan Valega is the Owner of SERVPRO of Medina County. She was one of the first SERVPRO franchises and started the business in 1977. She has certifications in Fire & Smoke Restoration, Water Damage Restoration, Odor Control, and Applied Structural Drying. Jan is also has Lead Based Paint, Renovation, Repair, and Painting certified. Certified in IICRC. Ron is the General Manager of SERVPRO of Medina County. Ron has been the GM for 10 years. He is certified in Water Damage Restoration, Applied Structural Drying and Health & Safety. Charlene Halblaub is the Operation Manager of SERVPRO of Medina County. She has 18 years of experience and certifications in Carpet Cleaning, Fire & Smoke Restoration, Water Damage Restoration, Odor Control, Journeyman Textile Cleaner, Master Fire & Smoke Restorer, Journeyman Water Restorer, Upholstery & Reinstallation, Journeyman Fire & Smoke Restorer, Health & Safety. Certified in IICRC. Michael Craddock is the Project Manager at SERVPRO of Medina County, Western Lake and Gateway. He has 8 years of experience and certifications in Water Restoration, Relay & Repair, Carpet Cleaning Technician, Renovation Repair & Paint Technician. Certified with IICRC. Laurel Houston handles all the Financial Aspects at SERVPRO of Medina County, Western Lake and Gateway. She has 8 years of experience and certification in Water Damage Restoration and Certified with IICRC. 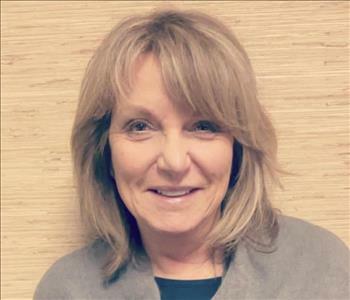 Kathy Peck is the Office Manager at SERVPRO of Medina County, Western Lake and Gateway. She has 15 years of experience and is certified in Fire and Smoke Restoration, Water Damage Restoration, Applied Structural Drying. Certified with IICRC. 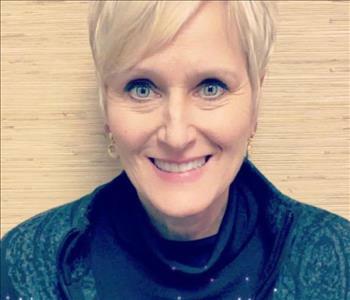 Lori Vanderwyst is the Commercial Sales/Marketing Representative of SERVPRO of Medina County, Western Lake, and Gateway. She has 15 years of experience and certifications in Water Damage Restoration and certified in IICRC. Dan is one of our Crew Chiefs. He has been with SERVPRO of Medina, Gateway, and Western Lake County for 2 years. He is certified in water damage restoration and fire & smoke damage restoration in IICRC. From Left to Right: Danny, Cody, Mike, Troy and Dan. 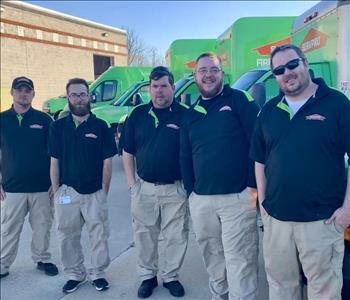 Each team that arrives at your home or business will have a crew chief that is running the job and will be your point of contact throughout the restoration process.